During summers, the scorching sun heat and dangerous ultra-violet rays can become hindrance in the enjoyment of your kids. They can't go outside to rejuvenate themselves and spend quality time with their friends at the playground. Overexposure to Sun at an early age can become the reason for many diseases. To keep them safe from these hindrances and also giving them adequate time to play at the same time, you can go for the shade structures. It is very important to have shade structures at your homes, offices, and outdoors. 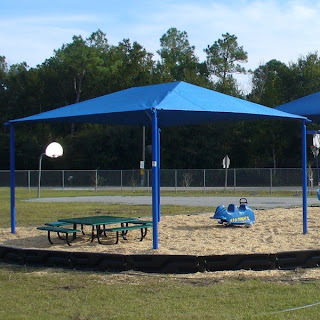 Shade structures not only keep your kids safe but they also look very elegant and stylish. You can find a number of shade structures available in different sizes, colors, and designs such as umbrella square shade, rectangular shade shelter, hexagon shade shelter, cantilever shade shelter, steel shelter, etc. Netting structure should be your first preference as it can block up to 90 - 95% of the UV rays from harming your kids. As it is available in different colors, you can choose a color complementing your garden and house. But steel shelters are very much in demand nowadays, as once installed they will last for at least for a decade. Longevity is one of the main reasons why people go for the steel shelter. At almost every public playground, parking lots, stadiums, etc. you can find the steel shelter structure. On the other hand, installing a steel shelter is very expensive. As most of the steel shelters have a basic design, so you can't also find a variety in its designs. Playground plays a vital role in the upbringing of kids. It not only gives them physical strength but mental strength as well. Your kid will get a chance to become socially active by interacting with other kids of the same age group. So, you should allow them going outside to spend quality time with their friends. But you should also not forget their safety from outside hazards and try to protect them as much as you can. As the skin of the kids are very sensitive, so you should make sure that there is a good quality shade structure at a playground to protect them from harmful Sun rays.